The Boscaini family has owned Agricola Masi since the late 18th century, their winery and vineyards based around the city of Verona in the Veneto region of northeast Italy. The company has grown its Veneto vineyards substantially over the years, but has been expanding its operations in other Italian regions, managing an historic estate in Valpolicella, involved in a joint venture in Trentino, high on the Austrian border, and then developing a wine estate in Tuscany called Poderi del Bello Ovile. But the company’s expansion took an altogether more unexpected turn when it created Masi Tupungato, making wines in Mendoza, Argentina. I recently had the opportunity to taste through a small selection of their large portfolio, of wines from the Veneto and from Argentina. 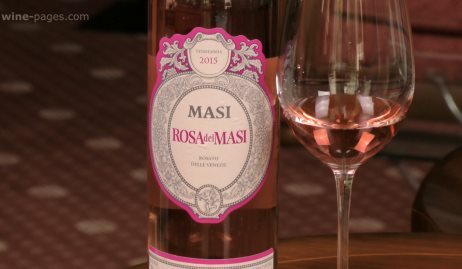 Masi’s wines are relatively easy to find in shops and in restaurants around the UK, and stockists are given where known. But please see wine-searcher.com for all UK stockists of Masi wines. Grapes for this wine come from Friuli, 75% Pinot Grigio and 25% Verduzzo, the latter dried for three weeks on racks to concentrate the fruit. It has a very attractive nose, with touches of baked apple and spice and hints of more exotic pineapple. Weighty and powerful on the palate, there is some richness and silky texture, with plenty of clean melon and peachy fruit, and a touch of honey into a long, dry finish. 87/100. £7.99, Tesco, and see all UK stockists on wine-searcher.com. 35th anniversary vintage of an old favourite of mine (a blend of Corvina, Rondinella and Molinara), and in many ways the first of the modern Ripasso wines, made by refermenting fresh wine with a small percentage of dried grapes. It has a smoky tobacco and fudge nose, with baked plum fruit on the palate and a bite of tangy cherry skin moving into a more chocolaty character again on the finish. Long and crammed with character at a modest price. 89/100. £8.99, AG Wines, and see all UK stockists on wine-searcher.com. Brolo is a ‘clos’, or single vineyard, from which this wine comes. A blend of 80% Corvina and 20% Rondinella, it is very perfumed and gives a velvety impression on the nose, with a touch of something herbal to ripe, sweet cherry fruit. Very nice texture and seductive structure and mouthfeel, with a silkiness and smoothness to the tannins and excellent length. A little more refined than the regular Campofiorin perhaps, despite more oak and power. 90/100. £11.49, AG Wines, and see all UK stockists on wine-searcher.com. Another blend of local Corvina, Rondinella and Molinara, this time made by the “appassimento” method, when all grapes are dried for a few months before vinification, by which point they are concentrated and raisined, and weigh only around 35% of their harvest weight. It has lovely dried herb and earthy, savoury character with notes of smoky Lapsang souchon tea leaves and dark cherry fruit. The palate has lovely life and vibrancy, with a crisp cherry edge to chocolaty fruit and silky tannin structure. Very good balance. 93/100. £22.49, AG Wines, Tesco, Oddbins, and see all UK stockists on wine-searcher.com. Serego Aligheri is an old Valpolicella estate from the 14th century, managed in a partnership between Masi and the owners, but Masi controls everything from vineyard to bottle. This Amarone is aged in cherry wood for three months, and has a tight, black fruit nose with cedar, with some chocolate and plum and prune depth. It has really lovely finesse and warmth on the palate, but the tightness of the structure powers through into a long, concentrated, but really quite elegant finish. 94/100. £32.79, Bottle & Basket, Luvians, Cambridge Wine, and see all UK stockists on wine-searcher.com. A blend of Malbec and 30% semi-dried Corvina, aged in French oak. This has a lovely rich, dark, chocolaty nose with deep cherry and plum fruit. Lovely fragrance and elegance, with a cherry lift on nose and palate and very good acidity. 89/100. £8.99, Tesco, Oddbins, Selfridges, and see all UK stockists on wine-searcher.com.